January 6, 2011 — They say that stuff can’t make you happy, but I’ve met my share of collectors (here, here, and here, for instance) who would disagree. And they all have the cool stuff to prove it. I’m not sure about the psychology of a collector, whether it’s sheer greed (I want that), childish wonder (I want that), whether they’re building a comfortable nest or a wall of separation, but each one believes that the planet is not glass case enough and dedicates large parts of their lives and finances to gathering stuff within a delineated area, where, under ideal conditions, it is catalogued, displayed, cared for, and regularly appreciated. Actually, collectors do a service for the world. Collecting gives individual items context, preserves them and the stories behind them, and inspires wonder. They help us continually re-learn what an exquisitely varied place our world is. I mean, seeing one aboriginal artifact or PEZ dispenser is interesting, but seeing one hundred of either at once gets us closer to the truth. In fact, most of our major museum collections all started out as private collections. The world needs collectors. And, heck, I just like those kind of people. 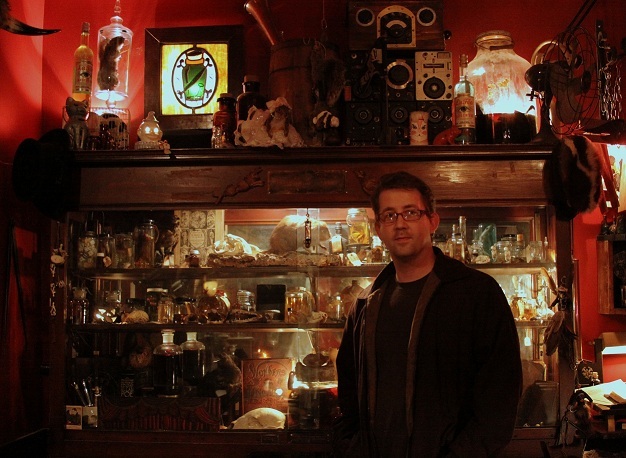 So on to a guy that collects bizarre taxidermy and human body parts. Trundle Manor is located in Swissvale, PA, a suburb of Pittsburgh, at 7724 Juniata St. It’s a private collection in a private residence that only in the past year and a half or so has been open to the public. There’s no entry fee, but donations are accepted. Dead animals don’t come cheap, except when they do. 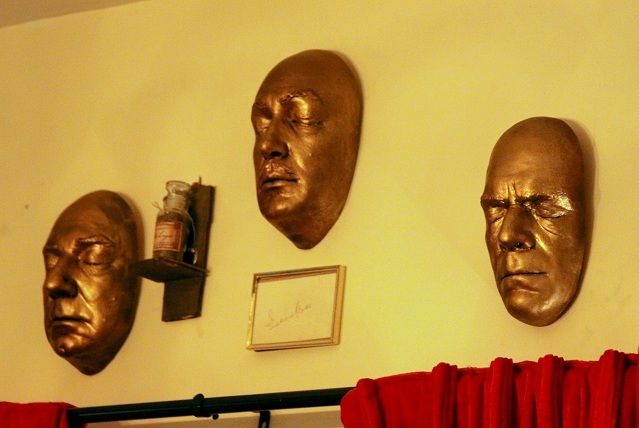 Of course, since the collection is displayed in the curator’s own house, visits are by appointment only. That sounds pretty formal, but all it takes is just a quick text message to see if your would-be hosts are in. Their contact info is right on their website and they’re pretty laid back and eager to show their collection. For me it was a brief email a night or two before. And then a day or so of the usual worry about entering a stranger’s home. Especially this time, since it was a stranger with a cleaver collection. I just kept telling myself that Leatherface never made a website. Now, anybody with a credit card can collect mass-marketed, factory-produced, officially licensed merchandise. But Trundle Manor houses the type of collection that takes more effort and soul-investment than the mere filling up of an Amazon.com cart. This kind of collecting has a tradition that goes back hundreds of years to the teen centuries of Europe. 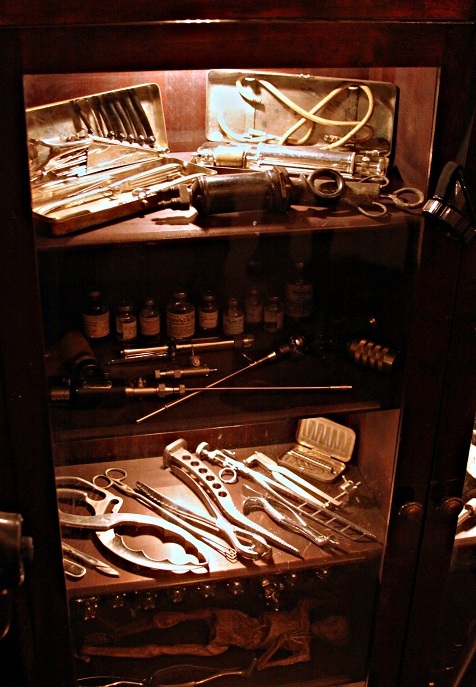 In Germany, it was called a Wunderkammer (or wonder chamber) and in England it was known as a cabinet of curiosities. These Wunderkammers (as always, it’s more fun to use the German name) often encompassed a mishmash of biological artifacts like skeletons and seashells, geological objects such as minerals and fossils, manufactured items like medical implements, and antiquities and art of all sorts. Anything preserveable and which stuck out to the collector as different from the mundane paraphernalia of their own everyday existence. 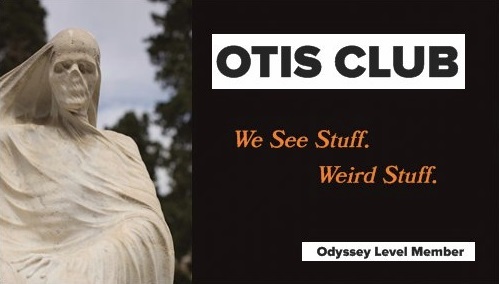 Oddity, basically, the purpose of which came down to having cool stuff to give people an excuse to visit and converse. It was the pre-television world, you know. 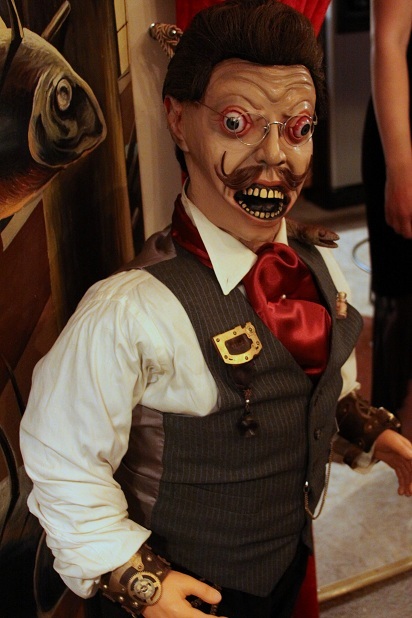 The man responsible for the Wunderkammer that is Trundle Manor is Anton Miriello, although he goes by the name Mr. ARM (I didn’t ask about the acronym, but I assume it’s his initials). His girlfriend Rachel Rech, who curates alongside him, goes by the name Velda von Minx. But don’t let the nom-de-guerres put you off. The manor isn’t awkward theater. They’ve merely adopted quirky personas to fit a quirky collection. It’s subtle showmanship. They’ll certainly have a normal conversation with you. 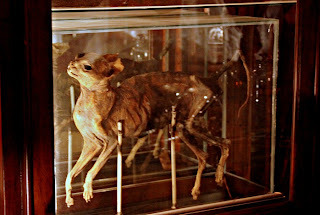 Well, as normal as it can be when the topic is infant speculums and mummified cats. We met our hosts just as evening was falling. They were both in their twenties, but sported outfits that were decades to a century too old for them. He had a handlebar moustache and a waistcoat. She wore leopard print heels at one end and a choker at the other. Both seemed equally excited about showing us the bits of dead animals that they had strewn about their home. The collection is pretty far-ranging, but definite themes, or sub-collections, are instantly recognizable. One of the first we noticed was the taxidermy. 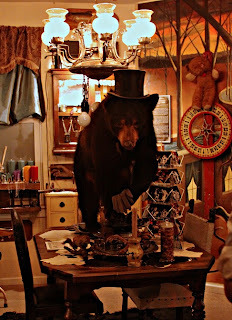 And that’s because they have a stuffed black bear in a top hat on their dining room table large enough to make eating off said table awkward. Or at least difficult. Although relating the boring events of your workday to each other is probably a lot more fun through a bear’s crotch. Mr. ARM Norman Bates some of the taxidermy in his collection himself (if you’re diagramming, Norman Bates is the verb in that sentence), but he also collects vintage specimens. 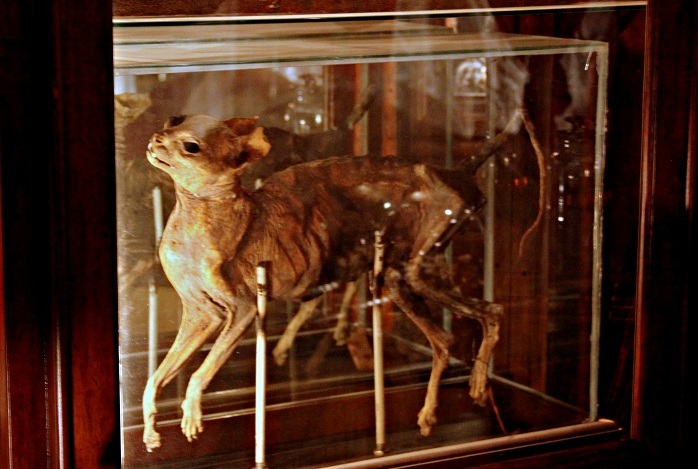 Often, the taxidermy in his collection veers wildly from the natural form of the beast. 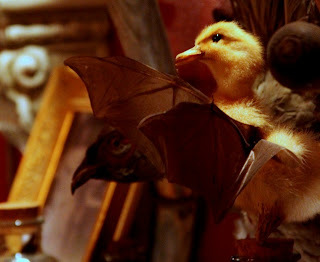 We saw duck chicks with bat wings, rabbits with antlers, and all kinds of other “gaffs” or fake creatures pieced together from real. Think Feejee Mermaid, mascot of Team Gaff. 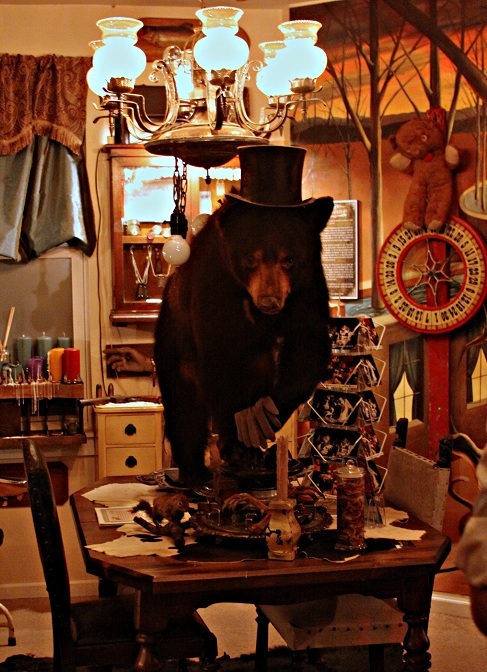 According to von Minx, "We like bad taxidermy better than good taxidermy. Just like we love B movies better." I can’t remember what particular piece that was in reference too, but the quote needed to be included. 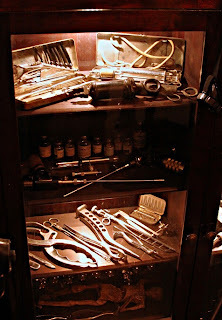 While he was showing us around his collection, Mr. ARM let out a ““Whoa. Cool!” at one point at the sight of a simple taxidermied squirrel set nearby. Thinking that was supposed to be my line, I said as much. He responded. “This wasn’t here when I left this morning.” His girlfriend then informed him that a six-year-old neighbor had brought it to them earlier that day. Sometimes the mountain comes to Muhammad, I guess. Of course, the fact that Mr. ARM could get excited about a stuffed squirrel when he was surrounded by human skulls, war-issue gas masks, and coffins definitely says something more succinct than my 1800 words. Surprisingly, they show you the crown jewel of their collection almost immediately. I can’t blame them, though. I’m not sure how long I could suppress the fact that I owned a human tumor. It’s part of a small collection of human body and human body-related parts that includes random teeth and Mr. ARM’s first moustache. 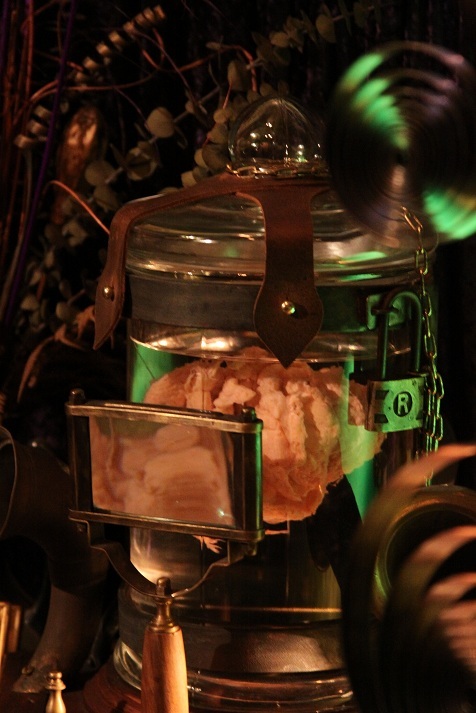 The pink tumor is of the ovarian sort, about the size of a fist, and it was donated by a friend of theirs named Olivia who’d had it removed and then donated to them on the condition that they build a cool display for it. According to the Gospel of John, you do what you have to do to get a human tumor in your collection, so it now resides in a painstakingly custom-made jar of fluid with interior lighting, a magnifying apparatus, and built-in speakers for its own personal soundtrack. It’s extremely mad scientist and, although this might be redundant, extremely cool. 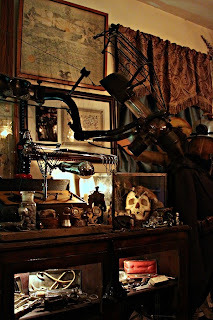 Other sub-collections range from animal skeletons to antique stuff to “dead things in jars” to vintage medical tools and devices, including an old-fashioned x-ray machine that looked like it was salvaged from the underside of a UFO from a 1950s alien invasion movie. He also pulled off the wall a specially modded rifle of sorts that was his own creation. Steampunk, I think the kids are calling it these days. 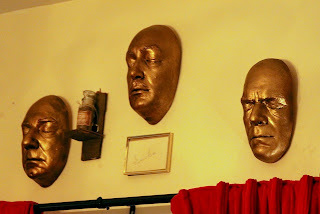 We also saw death masks of Vincent Price, Boris Karloff, and Bela Lugosi (along with dirt from the latter’s grave), a mechanical talking midget, an old mourning jacket, and plenty of less identifiable things, often in jars…and all before we made it to the parlor. The parlor seemed to be the hub of both the collection and their lives. 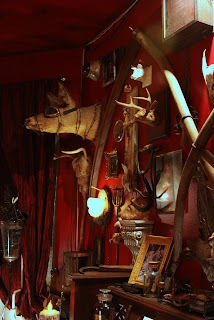 Red-painted walls adorned with animal skulls and edged implements seemed both very, if you’ll excuse the second reference, Texas Chainsaw and, paradoxically, very cozy. Couches and chairs surrounded a zebra-skin rug, along with a fireplace and an organ, while a pull-down screen and projector made it apparent that this room was where they drank cocktails and, when they could bear to turn the lights out on their collection, watch silent movies. Every horizontal and vertical surface of the room was covered in curiosities that ranged from caribou and coyote heads to the aforementioned set of old cleavers (he handed us his favorite, the one he’d grab at the first sign of an apocalypse or upon attack by a mean side of beef) , all well displayed and arranged, if not labeled. A gigantic display case that was originally built to display candy was now filled with more-grotesque-than-candy items completed the décor. Actually, it’s better that you see it for yourself. Here's a 360-degree view of the room. As to Mr. ARM’s own opinion of his collection, he somehow seemed to maintain both a sense of pride and a sense of proportion. Minutes after telling me that the whole purpose of opening up his home to the public was to share the wonder, he related the anecdote of his father’s summation of his collecting enterprise, "You have nothing but junk...it's just displayed really well.” Mr. ARM’s reaction? “It made me depressed and elated at the same time." ARM and Minx style Trundle Manor as a tourist trap in order to set everyone's expectations appropriately. In fact, all told, the collection takes up only three small rooms—an entryway, a dining room area, and the above parlor. However, were you to ask about every piece that strikes your fancy (or horror), you’d be there for quite a while. And they encourage that when they can. The curators act more as hosts than as tour guides. 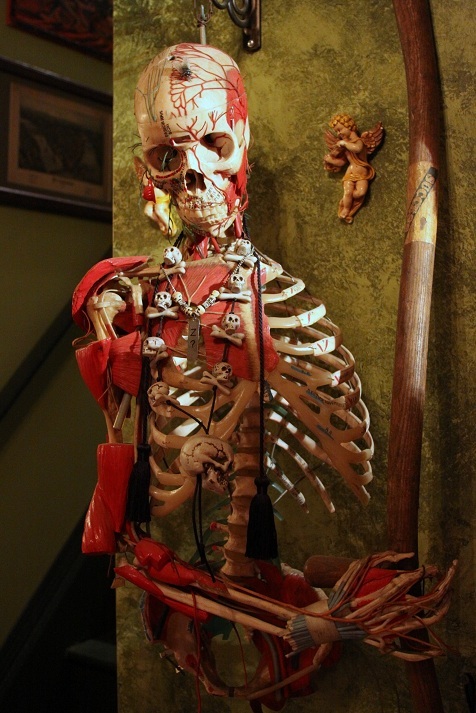 You want to sit down in the living room and ponder a rat skeleton over highballs? Go for it. You want to throw darts and discuss fantasy weaponry? This is the place. You just want to escape for a bit from a world of beige walls and landscape art? Light up a pipe and pull up a chair. Unfortunately, we couldn’t stay long enough to do any of that. We had to be four hours away before bedtime, and they had tickets to a Tim and Eric show. 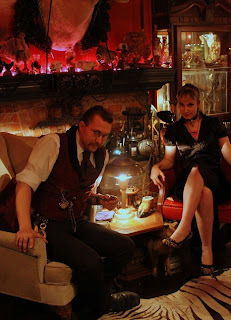 They gave us certificates that officially acknowledged our visit to Trundle Manor, as well as two small vials of liquid, each with a baby octopus tentacle in it. They were meant to be keepsakes, but I think they’re going to be piece one and piece two of our own imminently begun Wunderkammer. Anybody got a spare tumor that you’re willing to part with?